In December 1914, the Wesleyan Methodist Sunday School’s building in Heaton Mersey was transformed into one of the many Red Cross hospitals stationed across the UK, to help aid the injured soldiers of the First World War. 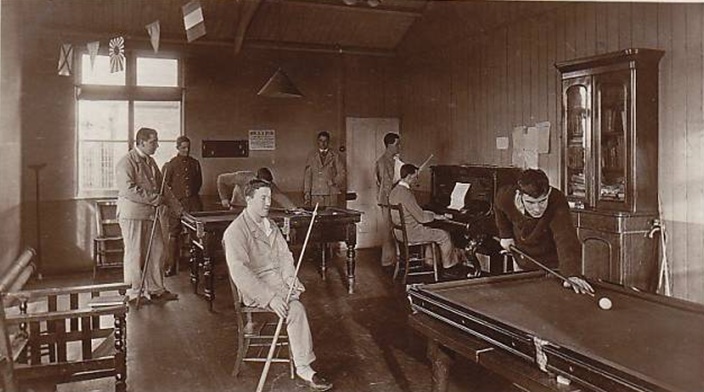 It has been known to have nursed over 2,000 men within its several wards, during the period of 1914-1918 (Image 1: Ward 2), helping the war effort. Looking over all of the entries though, it is clear that the soldiers did receive “the best” treatment, wherein they made caring “friends” and had positive relationships with those around them. 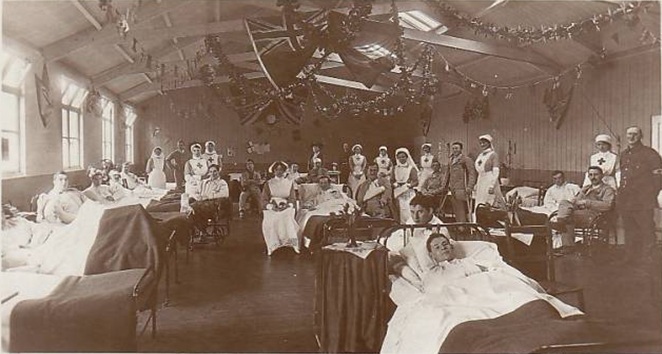 Some even expressed feelings that indicated they were in a “first class hospital” with the “most excellent nurses and staff.” (See image 2: depicting the recreation room, showing the many activities the soldiers were given to help enjoy themselves and make their visit more comforting, fitting this ‘first class’ standard). This means that from this book, a great insight has been gained, both into the great quality of the hospital as well as the thoughts and feelings of the individual men and their lives within the First World War. For they are good people there. This poem allows us to understand how grateful even foreign soldiers were, as well as how welcoming the atmosphere that Manchester presented must have been, creating a true sense of war patriotism. To crush the old Kaiser and his German band. When Germany was a pup. Therefore, these entries display the high hopes each soldier had, despite their brutal condition of physical injury – showing the true morale and enlightened feelings of each patient. Some of these entries have also sparked interest in the particular lives of the individuals and their own experiences of the war and their injuries gained. An example of this is that of Jack Bamber Roake, whose entry, that wishes good health to the nurses of the hospital, was written on November 26th 1915, after being wounded in France during the previous month. He is known to be the son of Margaret and Harry Roake and was educated at St Dunscan’s college from 1908 to 1910, before working as a clerk to RW Denyer & Co. During the start of the war period he became a gunner, enlisting in the 4th London ‘Howitzer’ Brigade. After spending a period in Edinburgh, he was then sent to France in 1915, wherein he was wounded and sent to Heaton Mersey’s Red Cross Hospital with an injured foot, before managing to return to France in June 1916. 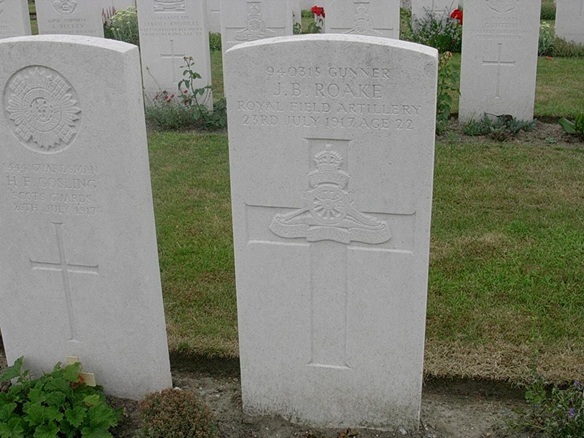 Unfortunately, he was later killed on the 23rd July 1917, at just the age of 22. He is now buried in Duhallows Advanced Dressing Station Cemetery, near Ypres. His death has also been heavily commemorated on several war memorials, including at the Church of St. Peter, Brockley, and St Dunstan’s College (see image 3). Therefore, hopefully the acts done by this hospital and the struggles endured by each one of its patients will be forever remembered from this plaque, autograph book and other archives – commemorating each one of their important lives, not allowing us to forget the harsh conditions they faced throughout the war. This means that although many of them may have unfortunately died, these accounts will continue to let their names and memories live on. This post was written by Hannah Clayton, a volunteer at Stockport Local Heritage Library.